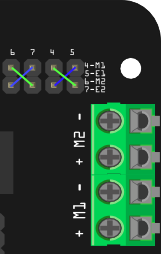 Please select Leonardo board when uploading a sketch by Arduino IDE. Serial port 0 or 1 Read more from Arduino.cc: Please use Serial1. ***() instead of Serial. ***() in code to communicate with devices connected to serial interface, i.e. Pin 0/1. e.g. Bluetooth, WiFi module, Xbee etc. Serial. ***() is for USB debugging on pc serial monitor. Analog 0: If you are going to use the Analog port 0, you have to pay attention to the switch(s1-s5), turn it OFF please. There are five buttons connected to A0, if you turn ON the button switch,then the A0 read value would be not the one you want. It integrated an external servo power terminal. The range of this power input is about 5~12v. 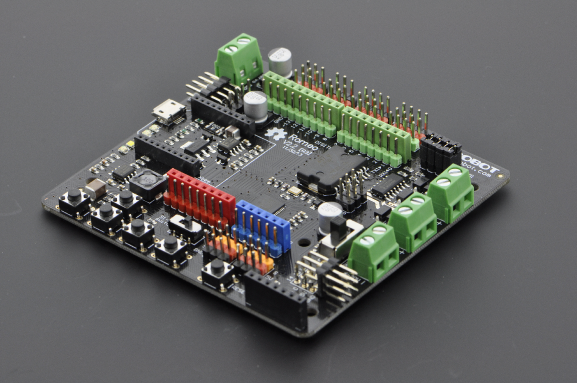 We recommend you to use 5v. So the servo power supply extension won't break the digital sensors connected to the 3p digital sensor interface. However,for driving 6~12v servos with the voltage input higher than 5v, it's not available to extend 5v sensor on all the digital sensor interface anymore. The servo power terminal won't supply system working voltage. On: supply power to the motor driver and system power regulator. The input range is from 5~23 volts. It's suitable for most of robot platform. Off: Isolate the system power supply from the motor power. In this case, it requires to supply system voltage from Micro USB port,5v power source to 5v & GND pins directly or 5~23v power source to VIN & GND pins. 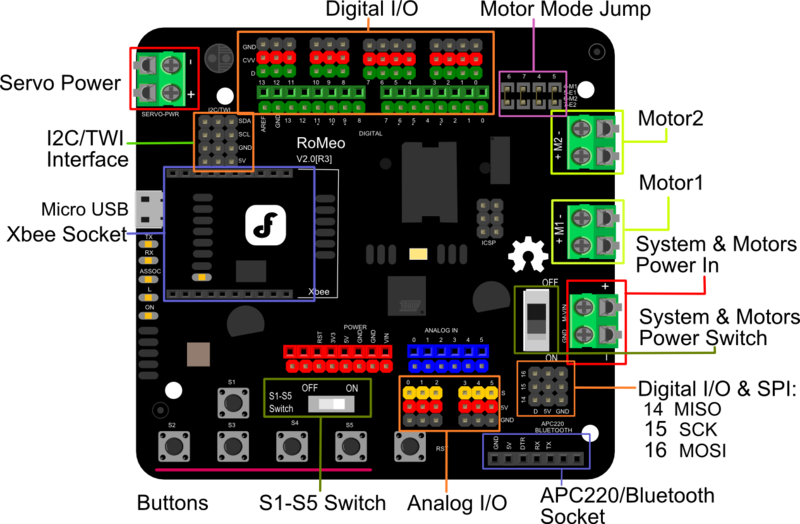 Get Romeo V2-All in one Controller R3 SKU:DFR0225_ from DFRobot Store or DFRobot Distributor.